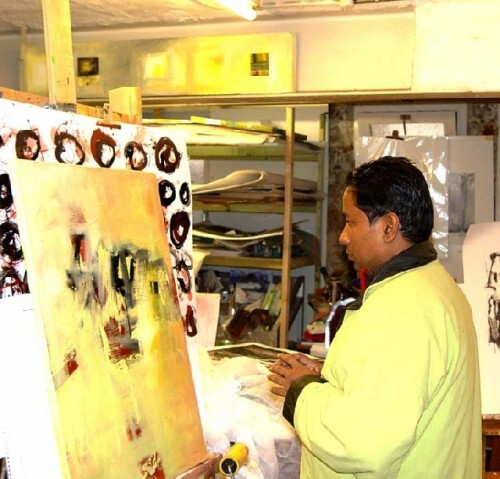 Rafique Sulayman looking at work in 2006. All photos submitted by Dorothea Fleiss. Rafique Sulayman and Dorothea Fleiss, 2006. The curator and art historian Rafique Sulayman is opening the exhibition: ‘Celebrating International Mother Language Day - National Martyrs Day of Bangladesh’ in Thimphu, Bhutan - February 11-21, 2011.' Artists from ten countries around the globe are participating. The countries represented are: Nepal, Japan, Honduras, Argentina, USA, Sweden, Greece, Germany and, of course, Bangladesh and Bhutan. Among them are Dorothea Fleiss, Ruediger Westphal and Erich Paproth from Germany. Sulayman is the regional respresentative for East-West Artists, based in Stuttgart, Germany. Fleiss heads the organization, which originally connected artists in eastern and western Europe, but has grown into a world-wide network. Bangladesh is maintaining a long lasting relationship with Nepal for centuries; Srigyan Atish Dipankar went to Tibet through Nepal, manuscripts of Charyapada and Vidyapati recently found in Kathmandu by the local scholars, in 1971 during the bloody war the then Nepali Prime Minister Kirti Nidhi Bista opposed the Pakistani aggression to the unarmed people of Bangladesh. In the stream of history, these events got a probe of manifestation of multi-dimensional knots between the countries. 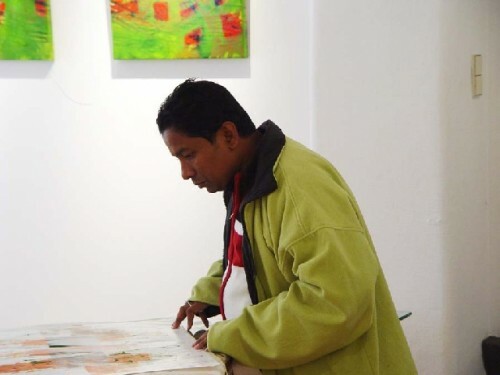 In the sector of fine-art, Bangladesh has a very special relation with Nepal since Pakistan period, when artist Manoj Babu Mishra joined the college of fine art as a student of painting department. He is now a big name in Nepal art. In 1981, during the 1st Asian art biennale, Nepali artist Batso Gopal Vaidya got the grand prize with Dr. Abdus satter. After that another two artists from Nepal received Asian art biennale (honorable mention) awards. They are : Kiran Manandhar and Asmina Ranjit. 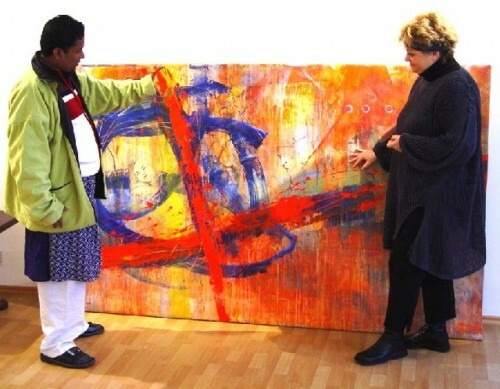 Bangladeshi national award winner artist Muhammad Eunus had a solo art show in Nepal in 2006, Ekushey award recipient Hamiduzzaman Khan, Ivy Zaman, Wazmun Nahar Runty, sculptor Habiba Akther Papia, Mahbubur Rahman, Tayeba Begum Lipi have been maintaining a very good relationship with the artists of Nepal. Besides, former ambassador of Bangladesh in Nepal, Imtiaz Ahmed (now in Thimphu, Bhutan) introduced a new idea of celebrating International Mother Language Day by exhibiting art-works of different countries. In 2007, International Mother Language Day observed in Nepal with the participation of 11 countries. Last year in June Bangladesh artists Professor Samarjit Roy Choudhury, Mostafizul Haque and sculptor Mojibur Rahman participated in an art fusion at Nepal Art Council with their Nepali counter parts. Internationally renowned artists like Shashi Bikram Shah, Kiran Manandhar, Shankar Nath Rimal, Hari Khadka, Jeevan Rajopadhay, Naresh Saiju, Shanta Kumar Rai, Gyanendra Bibas, Sagar Manandhar, Surendra Pradhan, Chanda Shrestha, Gautam Ratna Tuladhar, Shyam Lal Shrestha, Pragya Upadhyaya worked day-long with Bangladeshi artists. That was the first of its kind as the senior artists of both countries exchanged their views and thoughts at the same platform. Samarjit Roy Choudhury took the image of Darbar Square in his semi-abstract composition of red and purpl; Mostafizul Haque painted a political thematic Buddha image while Mojibur Rahman painted a scenario of Bangladesh. Among the Nepali participants, Shashi Shah made a big acrylic drawing of horse, Kiran Manandhar completed a semi-abstract painting in acrylic, Hari Khadka painted image of Ganga-Yamuna, Jeevan Rajopadhay painted semi abstract landscape, Chanda Shrestha made a beautiful landscape with trees, water-fall and mountains, Shankar Nath Rimal made a monochrome abstract drawing, Naresh Saiju came with water-fall and hilly villages, Shanto Rai made two female figures, Pragya Upadhyaya made a bridge from imagination in charcoal and wash and Gautam Ratna Tuladhar presented a dancing scenario of Newar festivity. Besides, artists of the two countries made some unique drawings on paper and canvas. Ambassador of Bangladesh in Nepal, Dr. Neem Chandra Bhoumik visited the fusion on June 16 and praised the output of the artists. He declared the workshop output should have been displayed on the occasion of Bangladesh Victory Day 2010. Ambassador Bhoumik initiated the idea of inviting famous Indian actor and UNFPA Goodwill ambassador Ms. Manisha Koirala to inaugurate the fusion in December 2010 at Nepal Art Council. The fusion and the exhibition were jointly organized by Buriganga Arts, embassy of Bangladesh & Crafts and Nepal Art Council. "all the best to you radw"